Discover an Elgin restaurant that’s ‘staked’ a position in the community, through a wide menu of mouthwatering food. Jimmy’s Charhouse, 2290 Point Blvd., Elgin, now in its 12th year of business, qualifies as a bona fide fixture in town. The 350-seat restaurant has flourished under founder Jimmy Panagakis, who heads Dining Out Enterprises, the umbrella group that also operates seven other north and west suburban restaurants, including a second Jimmy’s Charhouse in Libertyville. Partner George Kyriazis oversees the Elgin location, a popular dining spot; on weekends, diners are encouraged to make reservations. The key to the restaurant’s success? Atmosphere also plays a role. Inside the foyer, a large fireplace welcomes diners and warms those in the lounge. An old-time organ sits near the hostess station. An open kitchen and char broiler, a wood-rotisserie oven and various antiques create a warm, rich ambience in the dining room. Décor also includes photos of Panagakis’ hometown of Nestani, Greece. The kitchen is headed by Chef Ubaldo Pacheco, who leads the way on several signature steakhouse dishes. Of course, there are the steaks, all custom cut on-site. Then, there are rotisserie oven favorites, such as baby back ribs, chicken and pork. The menu also includes a surf-and-turf dish with a 6-ounce lobster tail and charbroiled filet mignon. Lunch specials change frequently, and recently included parmesan-crusted tilapia and a 10-ounce sirloin. The menu also includes a veggie stir-fry and several salads, such as the Grecian salad, with Greek olives, imported feta cheese, anchovies and Greek dressing; and the calamari salad, served with fried calamari, romaine lettuce and a Caesar dressing. A full complement of appetizers, a variety of pasta dishes, juicy hamburgers and specialty sandwiches round out the offerings. The carryout menu features chicken and ribs, in either single-serving dinners or family-sized platters, and includes several catering, side dish and dessert options. Jimmy’s maintains its high quality by dealing with as many local suppliers as possible, including Johnny’s Northwest Foods. The lounge has six TVs and provides live entertainment from October to late April. The full-service bar carries top-shelf liquor, wine and several national brands of beer, plus specialty brews such as Sam Adams, Blue Moon and Stella Artois. On Wednesdays, diners can enjoy martini specials. A private dining room accommodates up to 100 guests, and Jimmy’s offers a special banquet menu. 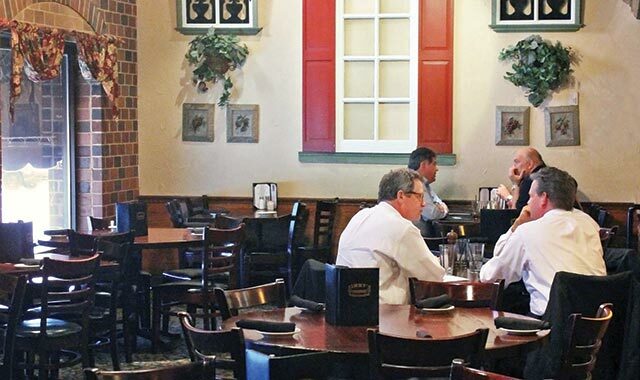 Located just off Interstate 90 and Randall Road, Jimmy’s draws big lunchtime crowds from nearby office complexes, and dinner guests not just from Elgin but several surrounding communities. Jimmy’s Charhouse is open Mon.-Sat., 11 a.m.-midnight, and Sun. 11 a.m.-10 p.m. This entry was posted on Wednesday, July 31st, 2013 at 12:00 pm	and is filed under Dining Guide. You can follow any responses to this entry through the RSS 2.0 feed. Both comments and pings are currently closed.